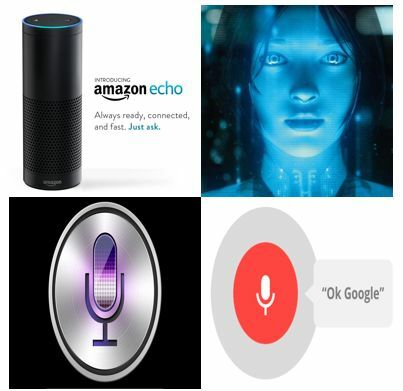 Simplified Analytics: Digital Assistants – Siri, Cortana, Alexa, Google Now? Digital Assistants – Siri, Cortana, Alexa, Google Now? In October 2011, Apple gave voice to iPhone 4s through Siri, the digital assistant to whom you could talk, when in need of some information. Since then the Intelligent Personal Assistants have evolved across multiple platforms. Later in July 2012, Google Now made a debut on Android smartphones. It was known for the ease with which it integrated with Google services and enabled tasks using cards that helped you understand what you need to do next. These Digital assistants have been catching on, offering a hands-free and more natural way to ask questions, find information and manage busy lives. Digital assistants accessed via smartphones can bring together geo-location and online activities such as booking travel, checking in on social media, finding restaurants or shops. They work by understanding as much about you as possible. This happens by accessing patterns and data from your email, track past GPS location patterns, as well as past requests made to it, by you. On top of that digital assistants continuously learn from the millions of requests it receives from users across the globe. Machine learning, as data scientists call it, enables them to adapt its responses depending on the nature of queries. Siri is the best at understanding natural language. It can pick up on multiple ways of asking the same questions, so you don't need to worry about remembering the exact phrasing for commands, but for now, it works only on Apple devices – iPhones, iPads & Apple TV but not yet on Mac. Google Now knows you from the collection of personal data and search you do all the time and it knows your daily commute, your interests, and details about your schedule. All that information coupled with artificial intelligence is used for the predictive "cards" feature, which shows you what you're interested in before you ask. Google Now works on Android, iPhones and even PCs. Cortana is quite cheerful, and its location-based reminders ("Remind me to call a friend when I get home") worked the best. Cortana's fate is tied to Windows 10, which Microsoft expects to be on 1 billion devices in two to three years. Cortana will also be available on Android and iOS and might be the most-used of the bunch by 2020. Alexa is inside the Echo, a speaker you place anywhere you like. It's always listening for its name and a seriously impressive microphone can pick up commands in a normal voice from across the room. Apple's Siri sometimes has problems with simple requests with accents, while Google Now is a personality-less arm of the company's search engine. Microsoft's Cortana is trying to be both clever and useful, but it's virtually nonexistent on mobile phones where we need it most. Amazon's Alexa is gaining steam in the smart home, but you can't ask it anything complex. Going into the future we may not need a keyboard and hands to type and everything will work on voice instructions. So get ready to meet some new husky interesting voices. Once you pick one, you might never break up!! Personalization of region wise accent worldwide is also an interesting development in Google. This might be a feature to increase user base.